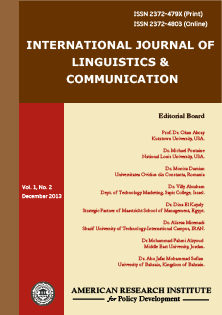 Editor-in-Chief Dr. Lasisi Ajayi, San Diego State University, U.S.A.
Each paper published in International Journal of Linguistics & Communication is assigned a DOI®number, which appears beneath the author's affiliation in the published paper. Click HERE to know what is DOI (Digital Object Identifier)? Click HERE to retrieve Digital Object Identifiers (DOIs) for journal articles, books, and chapters. Dr. Patrice Larroque, Université Paul Valéry, Montpellier 3, France. Prof. Dr. Ana Penjak, Department of Foreign Languages, University of Split, Croatia. Dr. Anna Kuzio, University of Zielona Gora, Poland. Dr. María Luisa Carrió-Pastor, Dept. of Applied Linguistics, Universitat Politècnica de València, Spain. Jonathan A. Aliponga, Ph.D., Kansai University of International Studies, Japan. Dr MOSTARI Hind Amel, Dept. of Foreign Languages, Djillali Liabés University of Sidi Bel Abbés, Algeria. Dr. Abdullah Al-Badarneh, Department of English, Jerash University, Jordan. Dr. Sandhya Rao Mehta, Sultan Qaboos University, Oman. Dr. Ali Ahmed Hussein, Department of English, University of Qatar, Doha, Qatar.